MidwayUSA has NRA memberships on sale. If you or anyone you know isn’t a member, now is the time. NRAILA.org/2019Petition — You can sign without donating. The Mississippi Highway Patrol/Mississippi Department of Public Safety and the National Rifle Association have announced that it will host the 2019 NRA National Police Shooting Championships at the Mississippi Law Enforcement Officer’s Training Academy* in Pearl, Mississippi, September 23-25, 2019. *Note that previous Mississippi-hosted NPSC events were at the Jackson Police firing range. The WWI cannons which have stood watch from the south side of the Mississippi Capitol for decades have been removed to the Armed Forces Museum at Camp Shelby near Hattiesburg, where they will be restored (sic) and put on display. State Department of Finance and Administration officials (in charge of state property) said they were concerned about maintenance of the cannons and the safety of children who climb on them, and that the DFA, along with the Department of Archives and History and legislative committees (all weenies) approved the move. We don’t have a report on the real reason. RW Arms and The Modern Sportsman are suing the federal government, alleging that the Trump bump stock ban regulation, which forces lawful owners to destroy or surrender the device (more than 73,000 in this case), is a physical taking of their property without just compensation in violation of the 5th Amendment of the US Constitution. Their case, The Modern Sportsman et al., v. United States, was filed on March 29th in the Court of Federal Claims, Washington D.C. In the US District Court case Andrew Teter and James Grell, Plaintiffs, v. Clare E. Connors, in her Official Capacity as the Attorney General of the State of Hawaii, and Al Cummings, in his Official Capacity as the State Sheriff Division Administrator, Defendants, the complaint challenges, on Second Amendment grounds, the State of Hawaii’s ban on butterfly knives (or balisongs), knives “having a blade encased in a split handle that manually unfolds with hand or wrist action with the assistance of inertia, gravity or both.” The United States District Court, Southern District of New York, recently declared the state’s ban on gravity knives was unconstitutional. Mississippi 2A attorney Stephen Stamboulieh. California gun owners’ groups estimated that easily more than a million standard and high capacity ammunition magazines legally flooded into California during a one-week window created when a federal judge temporarily threw out the state’s ban. Would have been more except for that limited supply thing. Note that all buckshot is capable of perforating multiple household walls, including the ones behind which your loved ones may be esconced. Federal Premium Law Enforcement has a comparison tool for rifle, pistol and shotgun defense loads. You know this stuff. But did you know 92% of carjacking victims were alone in their car at the time of the crime? Stay focused. 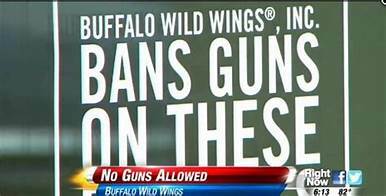 A Buffalo Wild Wings restaurant in Colorado Springs was robbed last week by two armed, masked men. I guess they didn’t see the sign. One sailor shot and wounded another and then was fatally shot at a Virginia Navy base last week. Gun free zone. Instagram has deleted The Firearm Blog’s account and all its contents. The US Postal Service has banned rifles from military commemorative stamps. Marti Buscaglia, Executive Director of the Alaska State Commission for Human Rights, Commission Chair Brandon Nakasato, and Vice Chair Freddie R. Olin IV, have all resigned in the wake of Buscaglia’s psychotic anti-gun antics. The San Antonio police department confirmed that two unidentified rookie officers were fired after they ran off during an officer-involved shooting last month. Pachmayr now has its aluminum speedloader in a 6-shot N-frame version, to fit 44 caliber: S&W 29/629/Ruger Redhawk/Super Redhawk/Colt Anaconda/Taurus .44/.444 Raging Bull. Loaders were already available for J,K and L frame sizes. Stevens 16 gauge O/U shotguns. Mossy Oak + American Buffalo Knife and Tool Company + high end steels = knives under $60? Nighthawk seems to be stealing Colt’s names, with two of its 1911 pistols being called the Agent 2 and the Trooper. April 19 marks the anniversary of the 1775 battles of Lexington and Concord that started the American Revolution with the “Shot Heard Round the World,” and the Second Amendment Foundation notes that the aftermath of events in Virginia clearly show that European animosity toward our right to keep and bear arms still exists. In the wake of the horrible tragedy at Virginia Tech, noted SAF founder Alan M. Gottlieb, European media — and particularly the BBC — has bared its visceral disdain toward America’s Second Amendment and the traditions of liberty and independence it represents and protects.